In a wonderful location, the Avalon could not be more convenient. The room sizes vary considerably, but provides all you could need. Would highly recommend! It was fun. Good location. Food was had to find close to it after certain hours and there was not anything to buy there except for vending machines. Bot overall I would recommend to a friend. It was a great place to stay. We highly recommend it. I stayed here for two nights. As a female traveling alone, I felt very safe in this location. Staff are extremely helpful and knowledgeable. The Avalon Hotel has a great location and the rooms are nice. Unfortunately when we arrived we were given a double room instead of a twin single as we had booked. Otherwise we had a pleasant stay - the rooms are clean and the staff friendly and helpful. Despite the overall 6.8 based on my answers (which were answered fairly). This is not a 6.8 hotel. It really is down around a 3. Our room was tiny. No air con so if we needed air you had to open a window and let the rain come in. The breakfast is shockingly overpriced. If you happen to need to contact the hotel good luck with that. I'm now on to 5 emails with only 1 reply. This is an overall poor hotel and would advise people not to stay here. 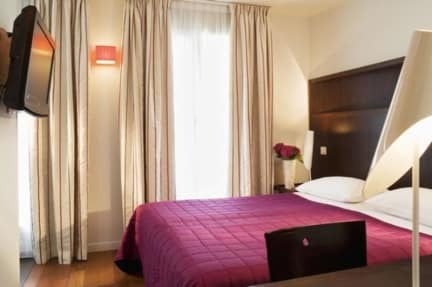 The hotel is conveniently located near the Gare de Nord, about a 5 minute walk, with detailed directions provided in the confirmation booking email. The facilities are adequate, nothing fancy. 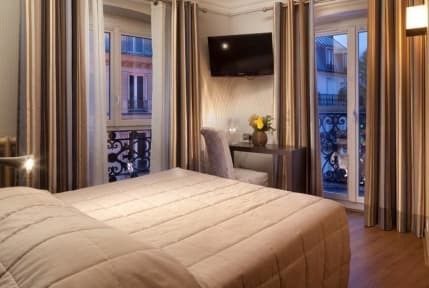 The beds are comfortable and a daily room service is provided. Free luggage storage is a bonus for those who are not travelling until late in the day. Terrible place to stay. The rooms are small and dirty. My shower curtain smell terrible, the hair dryer is useless. Very very very noisy, the room is facing the main road and you can hear car passing by and honking sound every minute. It was a mistake booking this hotel. It looks more like a hostel.